Are you looking for a Christmas party favor or a fun holiday gift idea? 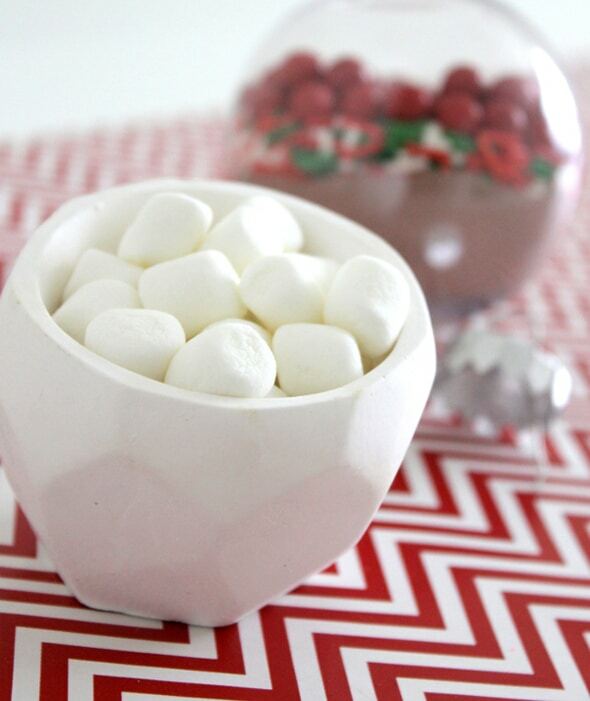 Make these Easy DIY Hot Chocolate Ornaments! 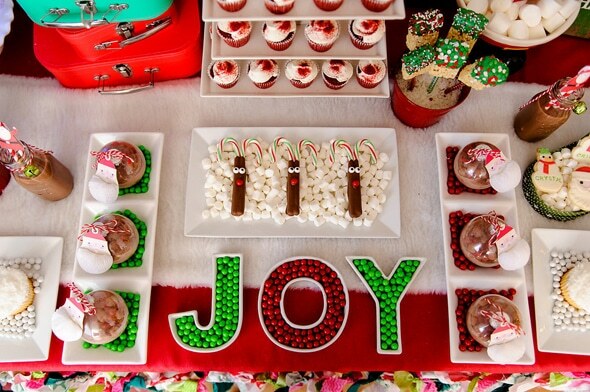 Pretty My Party recently styled a Holly Jolly Christmas Party featuring the adorable Land of Nod Holiday Party Collection. 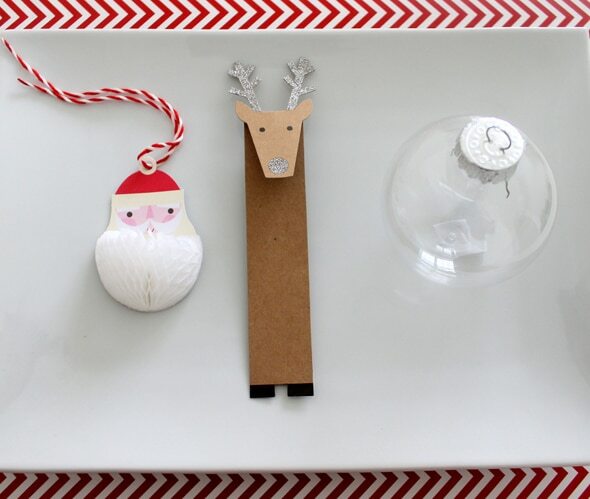 We just couldn’t resist their oh-so-cute Santa Claus and Reindeer Gift Tags and thought what better way to style them than on some simply stylish hot chocolate ornaments?! These DIY Hot Chocolate Ornament Party Favors were the perfect thing for each guest to take home and make their very own cup of hot cocoa! With just a few simple and inexpensive supplies, you can create your very own Hot Chocolate Ornaments! Not only are these Hot Chocolate Ornaments adorable, but they are quick and easy to make and won’t cost you a lot in supplies. Hand them out to your party guests this holiday or give them as gifts to friends, families, neighbors or co-workers. 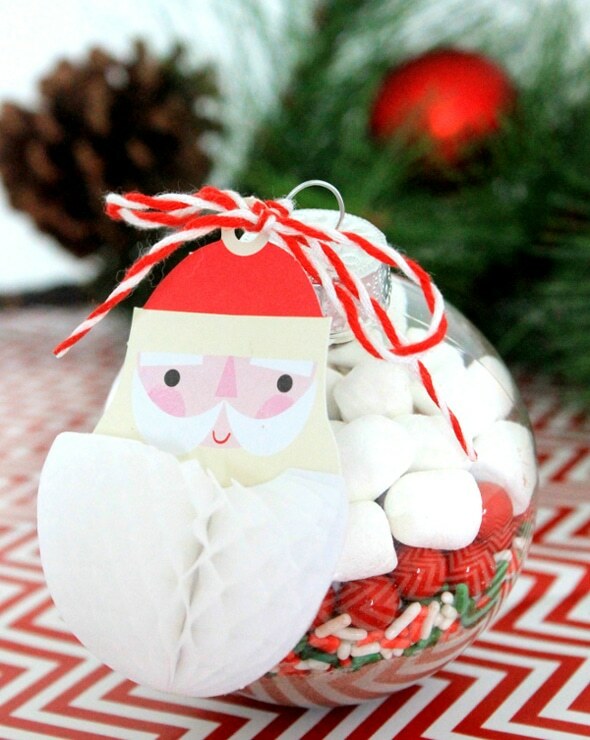 Everyone will love receiving these cute DIY Hot Chocolate Ornaments. 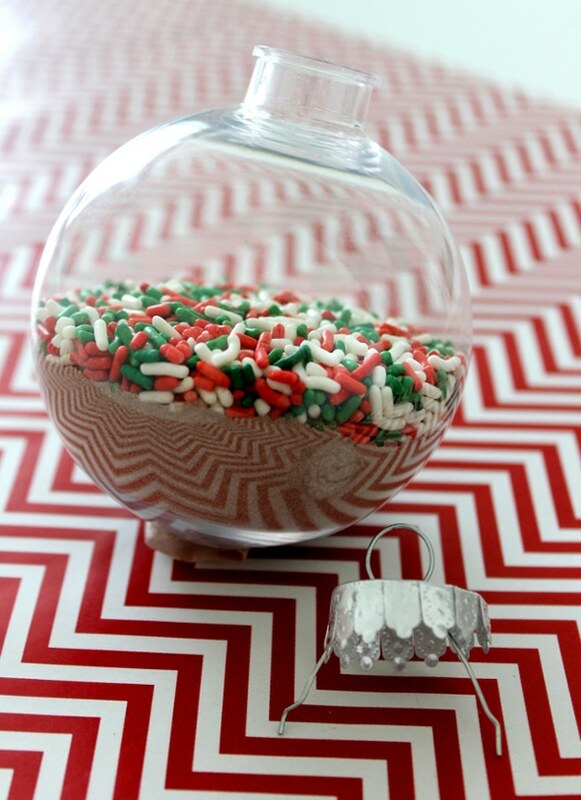 To make these easy DIY Hot Chocolate Ornaments, you will need clear plastic ornaments. Next, you’ll need some hot cocoa mix, holiday sprinkles, Sixlets candies and mini marshmallows. 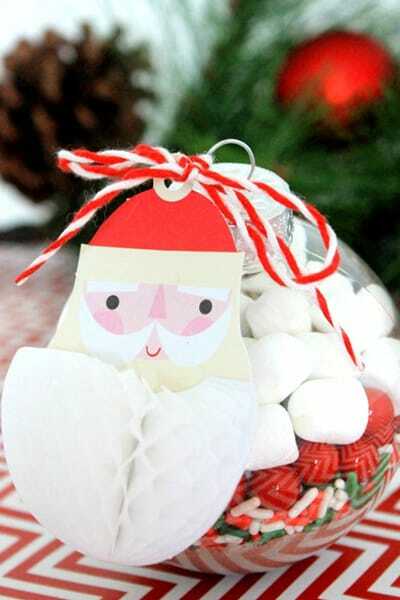 Some other items you will need to make these hot chocolate ornaments are some holiday tags and a funnel. 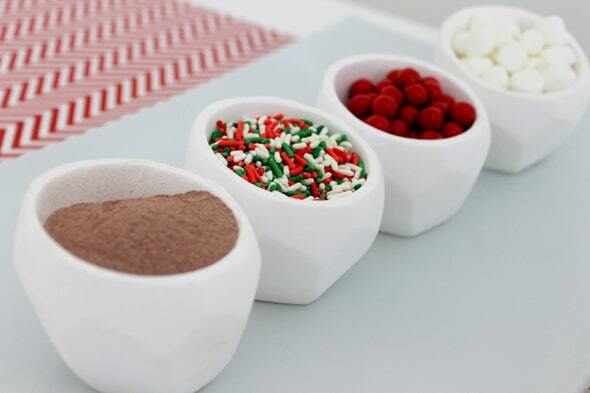 So, now that you have all of your ingredients in place, it’s time to get started making your hot chocolate ornaments. Begin by removing the top of your plastic ornament. 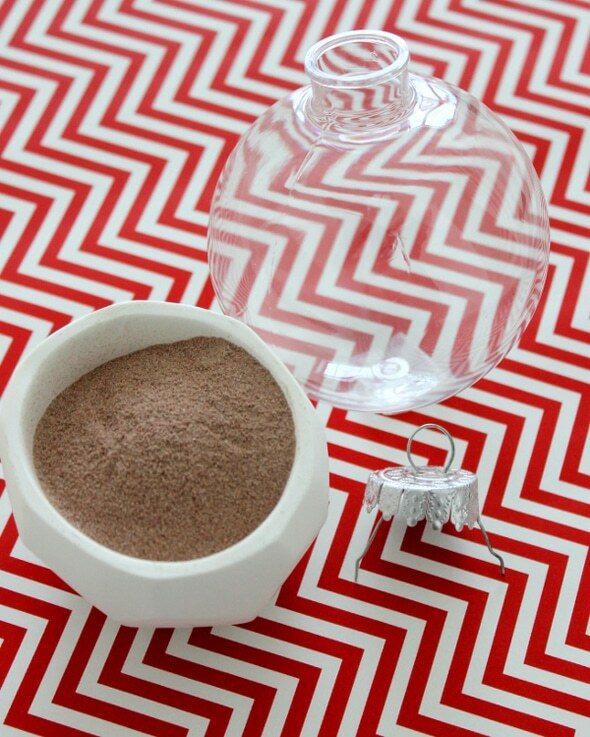 Using a funnel, carefully pour your hot chocolate mix into your ornament. We used approximately 2-3 packets of hot chocolate per ornament. 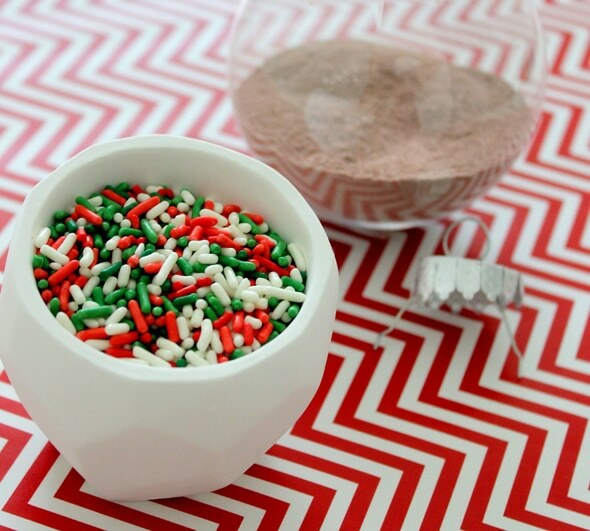 Next, it is time to add your holiday sprinkles! Again, using your funnel, add the sprinkles into your ornament, evenly coating the layer of hot chocolate. The next layer will be your candy! We chose to use red Sixlets. 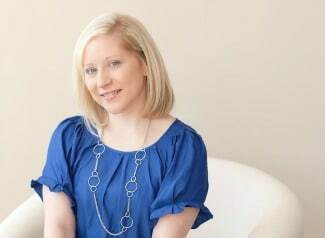 They were the perfect shape and color! Carefully add your candies, making an even layer on top of your sprinkles. And now it’s time for the marshmallows! 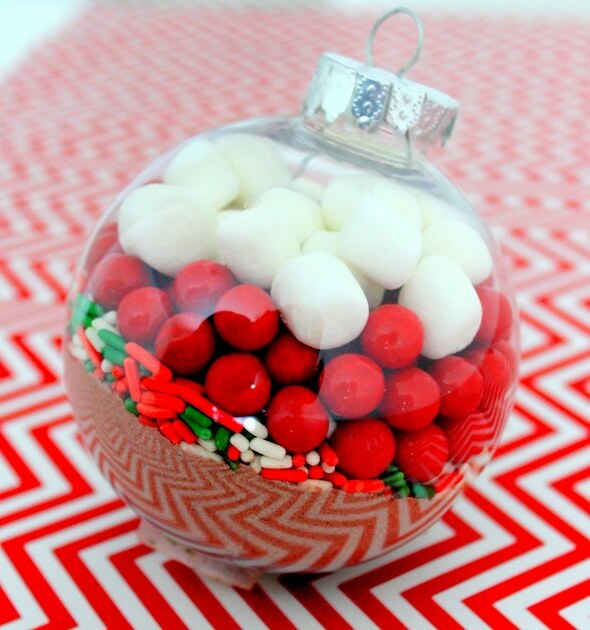 Add a layer of marshmallows, still allowing a bit of room for the top of your ornament to fit in. 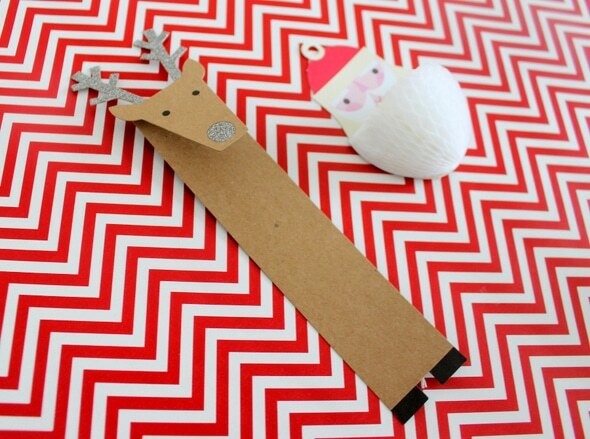 Gently replace the top of your ornament and attach your Land of Nod Christmas gift tag. 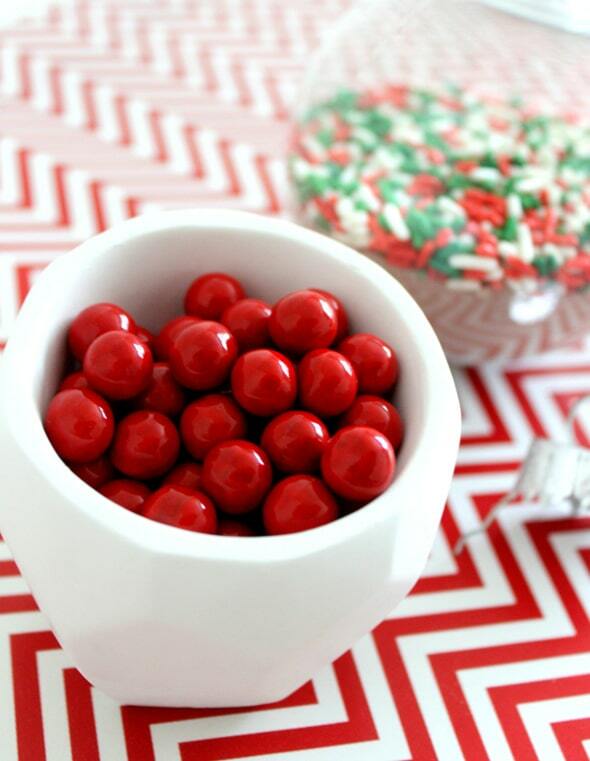 You now have a colorful, festive Christmas party favor or holiday gift! Kids and adults alike will love this sweet holiday gift idea! 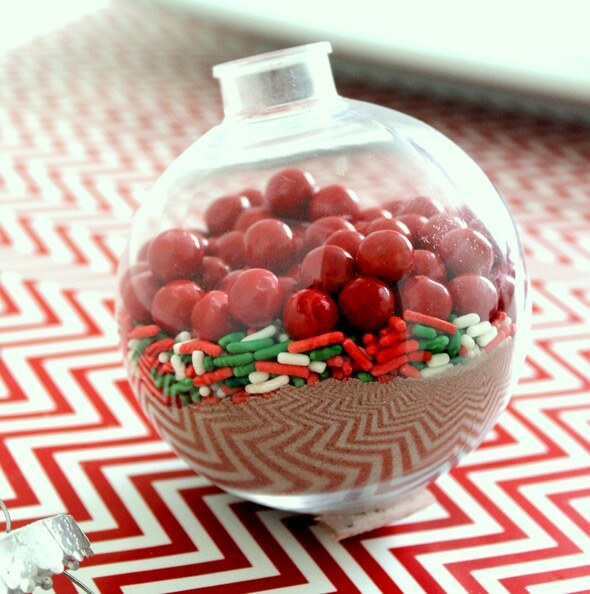 If you take a look at the holiday dessert table above, you will see the hot chocolate ornaments are perfectly placed on the holiday sweets table for everyone to enjoy. They truly make the perfect holiday party favor or gift for friends, family, neighbors, classmates, or co-workers. 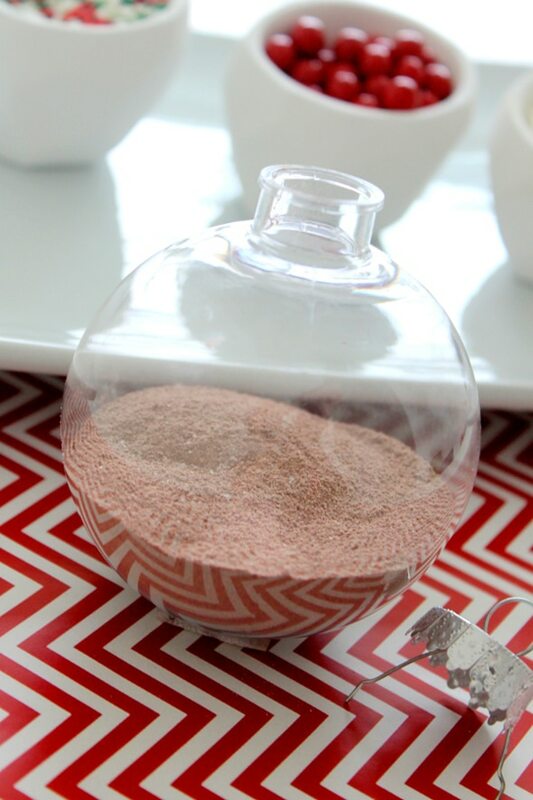 What do you think of these Easy DIY Hot Chocolate Ornament Party Favors? Let us know in the comments below. These Easy DIY Hot Chocolate Ornaments make perfect Christmas party favors or gifts for friends and family. Begin by removing the top of your plastic ornament. Using a funnel, carefully pour your hot chocolate mix into your ornament. We used approximately 2-3 packets of hot chocolate per ornament. And now it's time for the marshmallows! 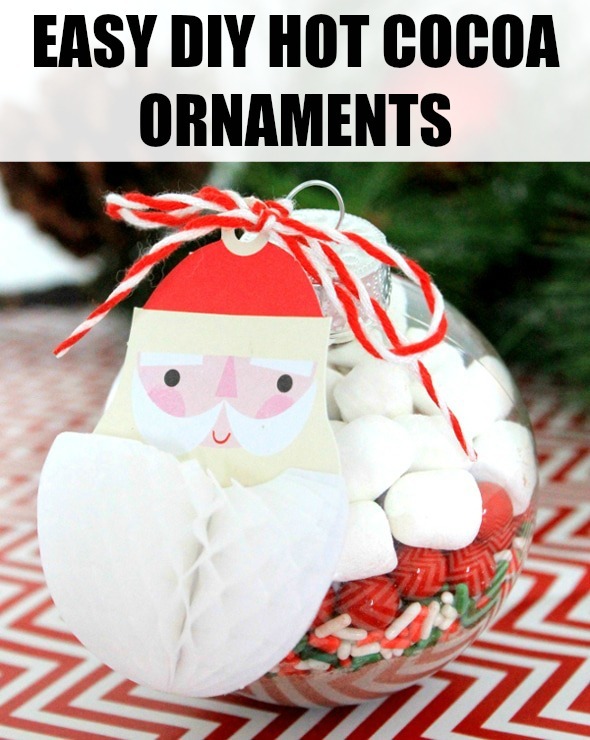 Add a layer of marshmallows, still allowing a bit of room for the top of your ornament to fit in. These are so cute! What a great gift idea.